Located on the South East of Taunton, this development has been carefully designed to create attractive street scenes set amongst open parkland. Situated within easy walking distance of the town amenities, it also benefits from being adjacent to open countryside. As a result, the location boasts fantastic scenic country views and walks including the East Deane Way and a network of footpaths that link to the town and countryside. 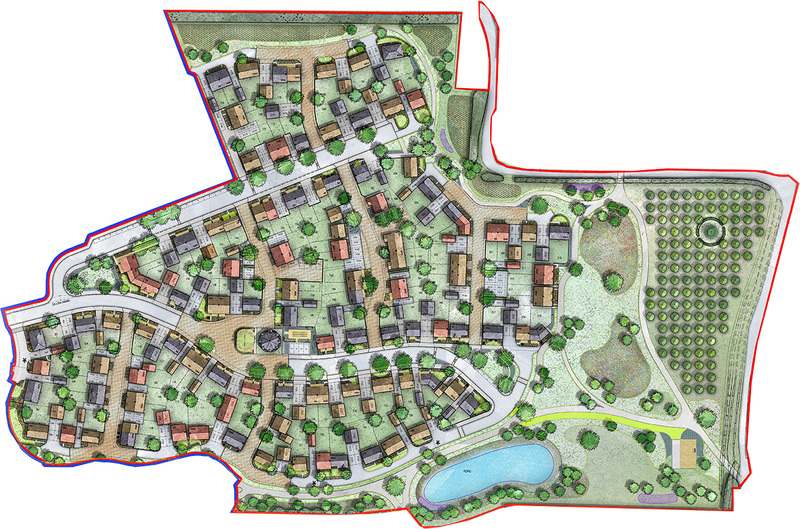 The total residential development covers approximately 22 hectares of which 8 hectares will be set aside for open space. Nearly 3,000 new trees are being planted together with wildflower meadows and grass areas, an orchard and enhanced wildlife corridor to the Blackbrook stream. Play areas for children have also been considered and are catered for around the development. This ratio of open space to build is a lot higher than most other developments, with the aim of providing a picturesque, green environment for all homeowners to enjoy. A management company will be set up to maintain these areas for the residents. Life is all about getting the right balance and when you achieve that you tend to get more out of it. So your home should be no different. Everyone is looking for property for sale Somerset to meet their individual needs; whether that is being located in a desirable and attractive area, having a high spec finish throughout the interior of your home or you’re looking for your home to be as energy-efficient and environmentally friendly as possible. Every aspect of these homes has been carefully considered and constructed to ensure that you are getting the very best property. Great attention to detail and a high-quality finish comes as standard, giving you the perfect balance of being comfortable yet modern and long lasting. Understanding the importance that an energy efficient home has to your comfort and running costs, our homes feature cavity wall high-performance insulation and low energy lighting. Space within your home is as important as the open space outside, our homes have been built to reflect this giving you a light, open and airy feel within each room and the space to make the most out of your home. Killams Park can be found just on the edge of the town of Taunton enjoying both the close proximity to the countryside on its doorstep but also the convenience of amenities and facilities available within the town including, shops, private and public schools and leisure facilities. Taunton is perfectly situated for easy commuter access to the M5 and a mainline intercity railway station. If you’re looking to escape to the countryside you’ll be spoilt for choice with the Somerset Levels, Quantock Hills and Blackdown Hills all within reach to enjoy and explore. The site is well situated to take advantage of cycle paths and footpaths which provide safe and easy access to nearby places of natural beauty. Every aspect of these homes has been carefully considered and constructed to ensure that you are getting the very best property. Great attention to details and a high-quality finish comes as standard, giving you the perfect balance of being comfortable yet modern and long lasting. Customer upgrades are available subject to build stage, please speak with your Summerfield Homes representative for details.